Through her participation with UCCE EFNEP youth nutrition program, Mrs. Rojas-George receives nutrition curriculum as well as supplemental materials for use during each school year. 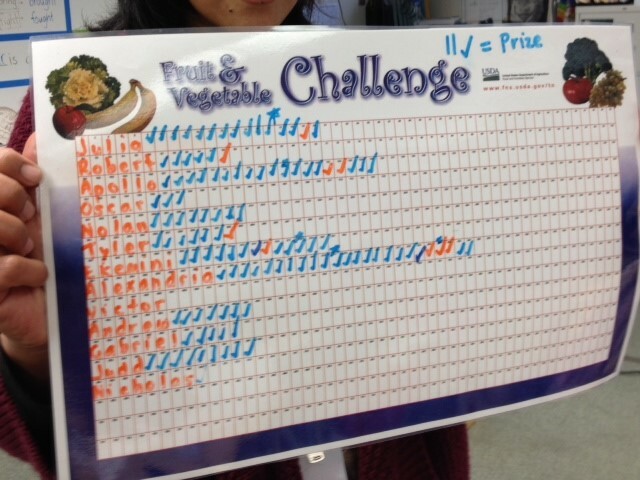 Last year, one of the extra incentives she received was a ‘Fruit and Vegetable Challenge’ poster to track her class’s consumption of fruits and vegetables. Mrs. Rojas-George teaches a 2/3 grade special day class, and her students can be picky about what foods they like and be somewhat limited in the foods they are willing to try. By using this poster, Mrs. Rojas-George encouraged her students to try a fruit or vegetable when they went to the cafeteria each day. When they had reached 11 ‘trys’ they received a prize for their efforts!